Okay, so I’m not too great at wiring up LED’s, that’s something I’ve learned about myself from this project. I know this after frying two separate IR LED’s and then completely frying an entire wii sensor bars IR LED’s and even the LED that tells you its on. See, what I’m doing is this: After I mounted the wii sensor bar to the headset, I noticed that the tracking wasnt great for turning the head and that I would have problems when it comes to mounting the wiimote as it would need to be directly infront of the users face. Not ideal really. 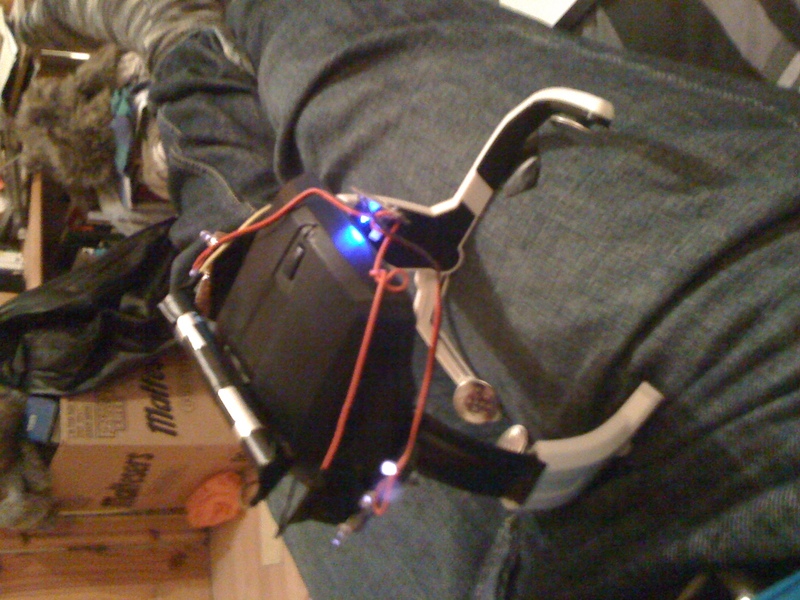 So, after me and Adam discussed this for a while, it was decided that the best course of action would be to mount the wiimote above the person, rotate the IR leds from the sensor bar and put them ontop of the headset so that they face upwards. This fixes alot of problems. First of all, I tried making my own sensor bar effectively by getting my own IR LED’s and mounting them to the headset. 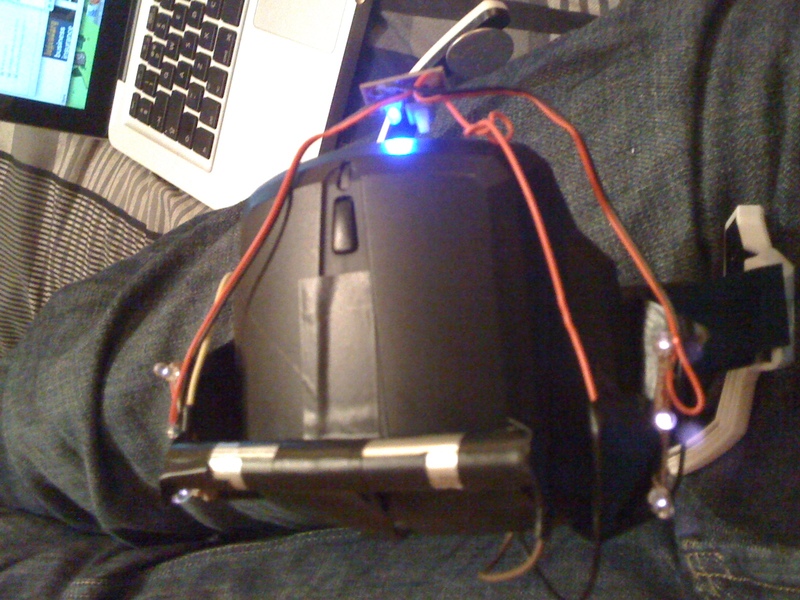 Problem is that the wiimote wouldnt pick up those IR LED’s for some unknown reason. And as I was wiring them up, I blew two of them by accident. Not sure how I did it either. Had one working, then moved a wire up in the breadboard and they both burnt out. Bugger. The only problem left was to take apart the wii sensor bar and mount the innards to the top of the headset to test this badboy out. Seems simple enough, except that I have the problem of being kinda clumsy and broke most of the wires off. I didnt happen to notice where one of the wires came from so as I was putting it back, my hand slipped and blew lots of LED’s. Bugger. So, take two, I took apart another sensor bar and very cautiously attached it to the headset. Horray! It worked this time! Nothing blew up! Some of the wires came lose though, but that is due to the poor soldering on the inside of these things. I can fix that with some soldering of my own later on. 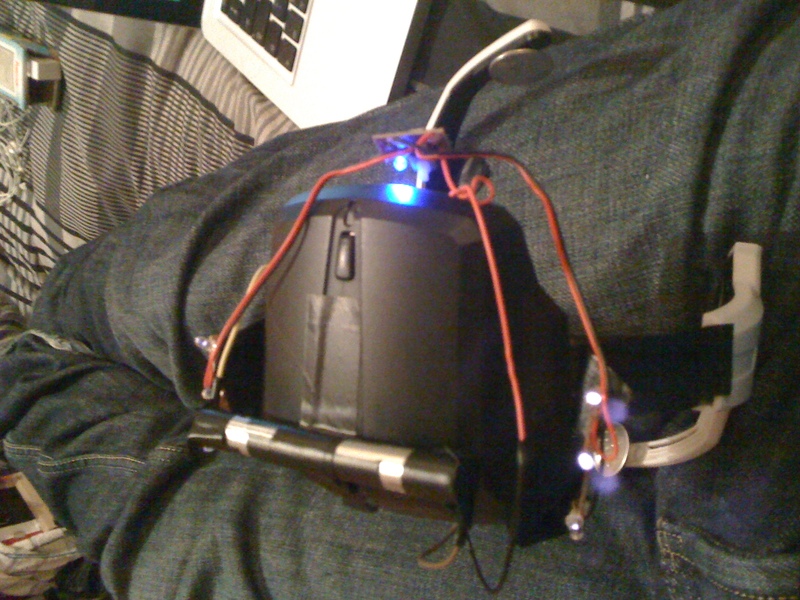 Right now, it’s held together with a lot of electrical tape, but it works and thats the main thing really. This way, it picks up head turning really really well. I can move my head slightly and have very accurate movement readings. It even picks up up and down movement alot better too. Wonderful. It also means that the screen can be as far away as I like just that the person has to sit beneath a bar, or near an angled wiimote above them. Just means I have to build a booth with a seat is all really. Nothing I wasnt considering before hand anyway.